Pinnacle hockey is back! 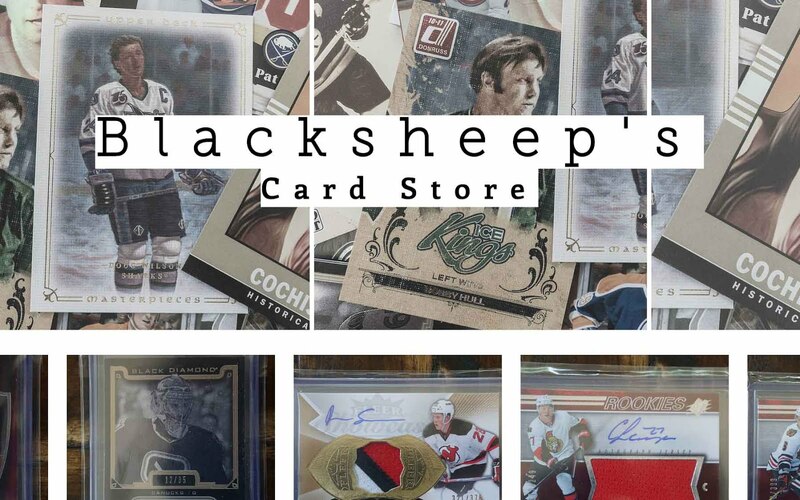 Panini brings back this premium brand with some old favorites and new twists! The Pinnacle base card is crisp, neat, and clean, but does nothing to remind me of the old Pinnacle sets. I will always remember Pinnacle as the premium cards with the black border all the way around the edge, and these are as far away from that as possible. These Pinnacle base cards are very bright - white is the dominant color choice here. And they actually remind me a lot of the 10/11 Donruss base cards. They are not a badly designed card, but it just doesn't bring me back to yesteryear. 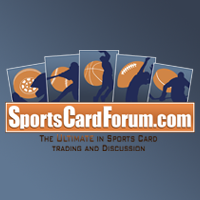 I'm pretty sure I said the same thing along those lines about Donruss in my review of that product too. I guess Panini wants the old name, but not the old design. It's their choice really, but I guess I would have liked to see more of a connection to the old product besides the logo on the base cards. 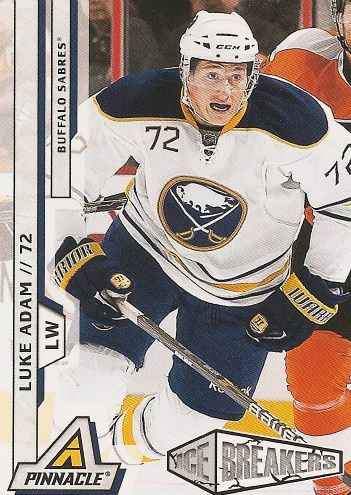 The front of the base card features a ghosted out border on one edge of the card. A bar with the player's name, number, team, team color, and position can be found there. The card looks 'ok', but definitely does not feel premium in any way. The Panini products that have come out this year have tended to be very flat looking (exception: Crown Royale), and the same can be said here. 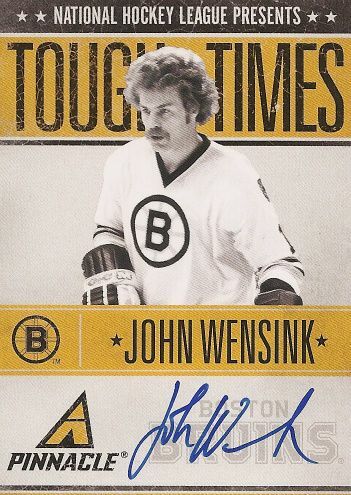 I think it would have gone a long way in terms of the design of this product if Panini had decided to put some foil or texture on the card to create a more three dimensional separation between the border and the photo. If they had done this the base cards would have been so much nicer. It might have even made me consider going for this base set, but instead it just left me wanting. Though I wasn't thrilled with the design, the one thing that really grabbed my attention was the choice of the photography. I loved looking through the base cards. I have to say that the photos chosen rival Upper Deck Series 1 and 2. Actually, many are more unique than those found in Upper Deck's offering. And that's saying A LOT because Upper Deck's base set features some really outstanding shots. Here are a just a few cards that show the variety that can be found within the Pinnacle base set. I chose to display these three cards in particular because they are representative of what can be found in the photography of Pinnacle this year. 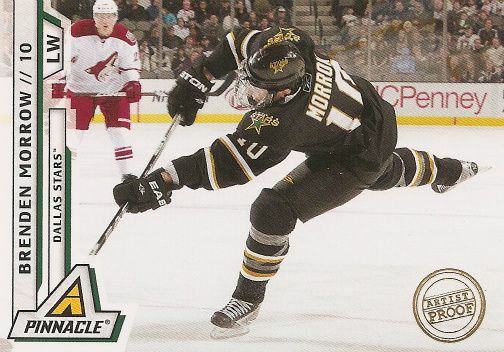 The Matthew Lombari card shows him off the ice in a public situation. Hockey players do so much off the ice that fans are interested in seeing. It's awesome to show off these things on cardboard. 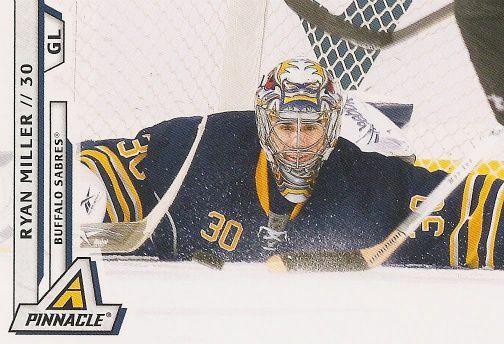 The Ryan Miller card is a great up close action shot. 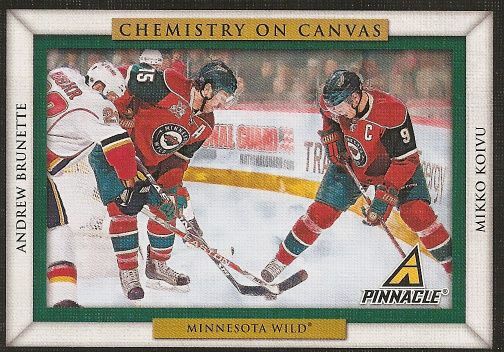 There are many action shots taken from hockey games in all the hockey sets, but many that are found in this Pinnacle base set are of higher artistic quality. It's like someone cared to put a great photo on the Pinnacle base cards! The Miller is a great example of great hockey action because you can see the intensity of the moment he is in, his concentration on the puck about to be shot towards him. 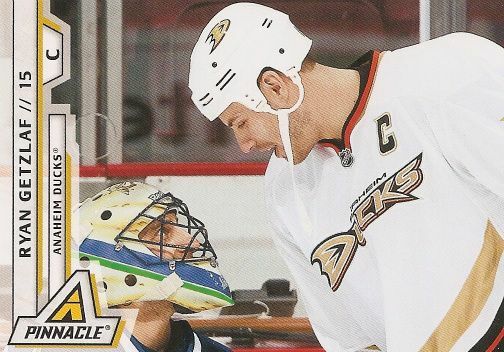 And I really like the Getzlaf card. My guess is that this photo was taken right after a whistle in a stoppage of play. It shows a great moment between him and Roberto Luongo. Who knows what was said! Was it a friendly exchange or something more intense. I don't know, but it's fun to guess! The backs of Pinnacle hockey feature the same photo on the front but no, yep I said NO, usual statistics section! Instead there is an informational paragraph about the player. 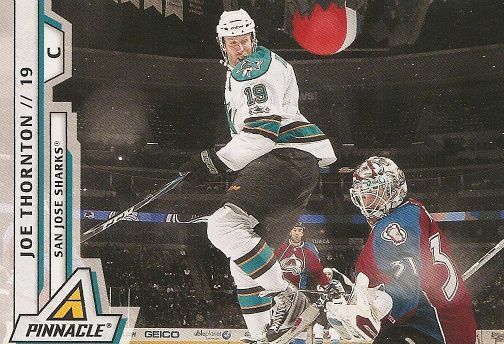 Some may not like this because it veers away so much from a typical hockey card, but this was something I thought was really neat about these base cards. It's great to read about the players on the backs of the Pinnacle cards. I'm sure it took a lot more and effort to do this but I appreciate their effort here. I have to give it up to Panini for doing that. Nice one! Rookies can be found in the Panini base set as well. On average, there are 4 rookies per box. The rookie cards look exactly like the regular base cards... EXACTLY like the regular base cards except they have a little graphic in the corner that says 'Ice Breakers'. Unfortunately, I don't think these rookie cards look that great. The design of the logo isn't inspiring... even the 'Rated Rookie' graphic is better! But again I say, if it were in foil maybe it would have at least looked a little better and felt a little bit more special. 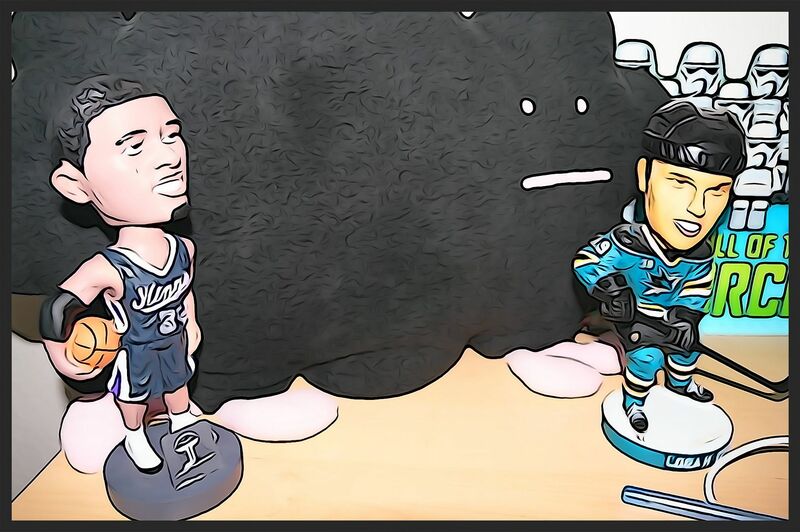 As is... hopefully next year's rookie card design will be better. All in all I have to say that the Pinnacle base cards have their ups and downs. There were things I really liked (like the photography), but things that I really didn't care for too (like the rookie logo and flatness in the design of the card). These base cards deserved a little bit more love before coming out of the factory. Some foil, some gloss, some texture! If they had that I think I would have definitely gone for a base set. 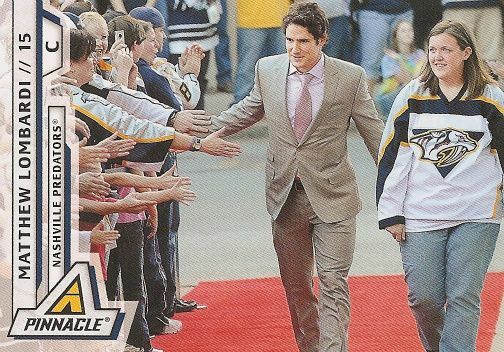 For now though, I have to say that there are some great hockey photos on some plain cards. Still though, the photographs really drove the base card score up. Lots and lots of inserts can be found in Pinnacle hockey this year. The most nostalgic one, though, definitely has to be the Nufex parallel cards and inserts. Back in the day, Pinnacle had something called Dufex. Basically it was a special looking foiling process that had a burst effect. I remember being blown away by them when I first saw them in Pinnacle baseball. I tried to collect as many as I could - but with very little money back then, and a big set, it just didn't happen. Well Nufex looks just like Dufex - and it's still cool. And it's still very collectible. And I still want them... all of them! I'm sure this will be a popular parallel set to try and complete for collectors who fondly remember these types of cards like I do. Here's an example of a Nufex Ryan Miller. You can see the bust effect pretty well here. Also notice how the card is textured. It's sort of like an Upper Deck Black Diamond card, but the burst effect makes it unique - and in my opinion cooler. These Nufex cards (also known as The Rink Collection) display exactly what I want from a card in terms of design stand point. The border of the card has not been 'Nufexed'. It has been glossed over for a more premium feel but does not have foiling. This difference in texture between the border and photo make a huge difference in card quality. It looks and feels great. Take some notes here Panini... this is how it should be done! I'm not saying the entire base set should have tons of Nufex or foil, but something... give it something!!! Alright, back to talking about inserts. Also making a comeback are the Artist Proof cards. Artist Proof cards always puzzled me greatly back in the day. These cards generally came one per box and just had a stamp that said 'Artist Proof' on them. They didn't look as nice as the Dufex cards but were harder to get. I always thought a nicer card should be harder to get. Well, that didn't apply then and it doesn't apply once again. The Artist Proof cards in 10/11 Pinnacle just feature a gold stamp on the front and come one per box. It's really nothing special - there's not even serial numbering on the card. I'm definitely not a fan of the Artist Proof parallel. I'm not sure the where the desire would be to collect these other than those people who need every single card of player for the personal PC. In terms of game-used inserts, Pinnacle has one called City Lights. These cards come with either jerseys or patches and are serial numbered. 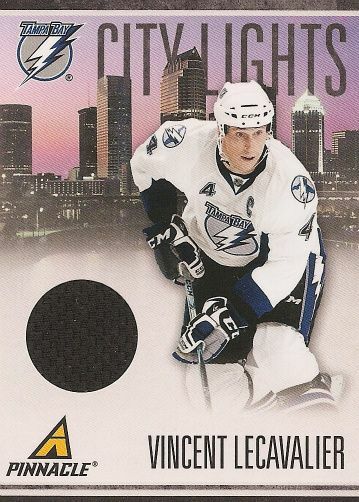 Insert sets featuring the home city of NHL teams have been done before, but I've always liked them. The City Lights insert set shows the skyline of the city of the NHL team as a backdrop for the player. It's simple and elegant. I like this design even though the jersey piece just floats there. The backs of the City Lights insert set give a little information about the city itself - not hockey information, but general historical information about the city. Autographs can be found in Pinnacle in many forms. I happened to pull one of John Wensink. This one is part of the Tough Times insert set. Didn't Donruss have an insert set similar to this? This particular autograph is nice because it features an on card autograph rather than a sticker. There are many opportunities to gather autographs in Pinnacle, but this is the one I got. It's serial numbered to 250. The next insert I will point out is the one shown above called Saving Face. I particularly like this insert from Panini because it's an insert that features something special - not just a differently designed card on the same cardboard stock as a base card. In the heyday of insert cards (the 90's before all the game-used stuff), insert cards had to stand out so designers had to think of ways to make them different. 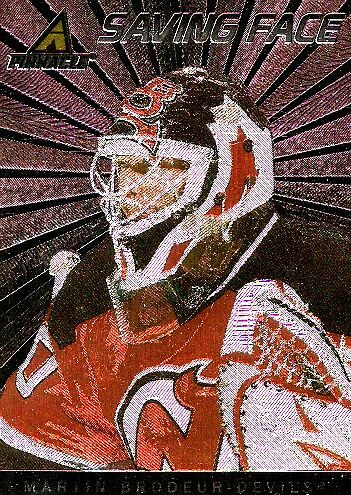 Often that meant adding lots of cool foil, or acetate, or some other gimmick. Nowadays inserts are printed on the same stock (there are exceptions, of course), with just a different design to make it an 'insert'. I'm glad to see that this insert features the Nufex technology on it. It makes the card stand out and special. Here's one last example of a great insert. This one is called Chemistry on Canvas. This insert set showcases players that work well together. Besides having painted artwork, which is already a nice addition, the texture of the card is like that of canvas. It has a rough feel on the surface of the card. 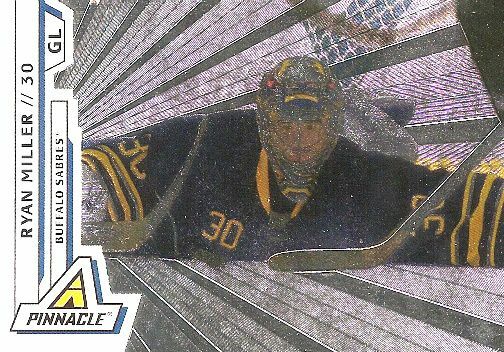 Though this type of texture has been done before (UD Masterpieces), it's great to have it adding variety to a hockey card release. I hope that Panini will continue inserts like these so that inserts will be special again. This year's Pinnacle also features other great insert sets, but none were pulled for this review. Let me know if you get any of these: Pinnacle Pencraft, Pinnacle Pantheon, Pinnacle Threads, Rookie Team Pinnacle Signatures, Team Pinnacle, Fans of the Game. 10/11 Pinnacle is a fun product to open. It features a great mix of inserts and super photography. At a little less than $100/box it's not too hard on the wallet. I'm pretty sure it's not going to be the hottest product of the season - but there will be cards in this set that people will enjoy. I really hope that collectors embrace the Nufex cards. They would look great in a binder all together and would be a worthy and challenging set to complete. Let me know if you go for it!